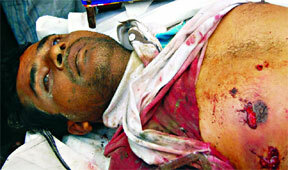 He was a member of Purbo Bangla Communist Party. By Bangladesh Media; The Daily Star reports, a leader of an outlawed organisation was killed in a so-called 'gunfight' in Kamarkhand upazila of Sirajganj early yesterday. Rapid Action Battalion (RAB) demanded he was killed because of gunfight between his accomplices and Rapid Action Battalion (RAB). Rab said Khorshed Alam, 34, was a regional commander of Lal Pataka, a faction of extremist outfit Purbo Banglar Communist Party. He lived in Jatibari Rasulpur village of the same upazila. Rab-12 director Lt Col ATM Anisuzzaman (BP, PSC) told The Daily Star that a team led by deputy assistant director Mafiz Uddin raided Char Tangrail village around 2:30am over information that a gang of miscreants were holding a secret meeting there. Sensing trouble, Khorshed and his accomplices opened fire on them, prompting the elite force personnel to retaliate. Khorshed died on the spot while his cohorts managed to flee the scene, the Rab officer said. A case was lodged in this connection.